This morning Sarah and I woke up early and drove 400 miles to Carowinds. First we went to the KOA Kampground a few miles south of the park in Fort Mills, South Carolina to check in and sent up our tent. By three o'clock we were off to the park. This we our first return trip to Carowinds since we first visited here in 2007. 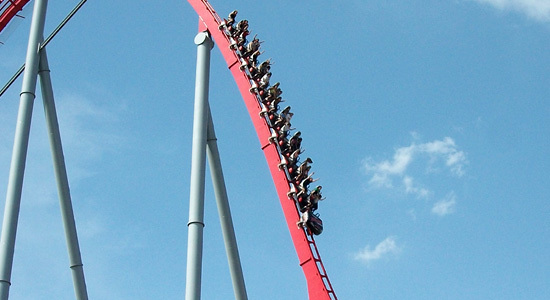 The park's new scream machine Intimidator is what brought us back. As soon as we were in the gate we headed for the 232-foot steel monster. At Sarah's suggestion, we waited for the front for our first lap. The ride is a blast. The first drop is awesome. The second hill has a surprisingly interesting twist and drop. 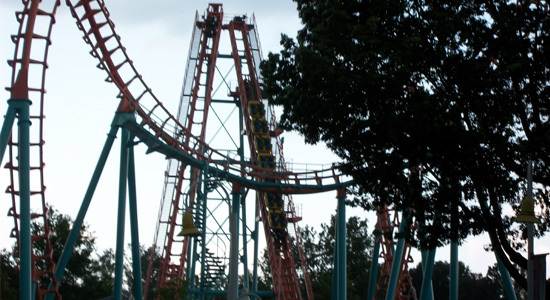 Each of the airtime hills is perfect. And the turn around is great too. The themeing of the ride is very well done and it's a great tribute to Dale Earnhardt. The trains look great as a Chevy Monte Carlo and the detail of the decals dating back to the late '90s shows that someone was paying attention to the little things. We then moved on to the other rides in the park. Many of the rides had new names and new paint since our last trip. Afterburn, with it's new name was still a great ride and a better name then Flight Deck that many of the other Top Gun coasters received at other Cedar Fair parks. Around five o'clock we could see the storm clouds moving in. We found a table and chairs under a roof to wait-out the thunderstorm. At about twenty after five there was a loud crash of thunder and lightning. We were sitting across from Carolina Cobra and I thought to myself "That's it, that lighting right there will close all the coasters." Cobra finished its ride cycle and the rain started to fall. Soon Cobra dispatched another train. This time as the train climbed the second liftchain there was another flash of lightning. 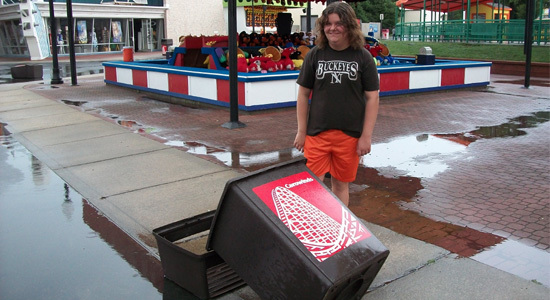 This one took out the power to the entire park. The train sat on the lift hill in a hard downpour. 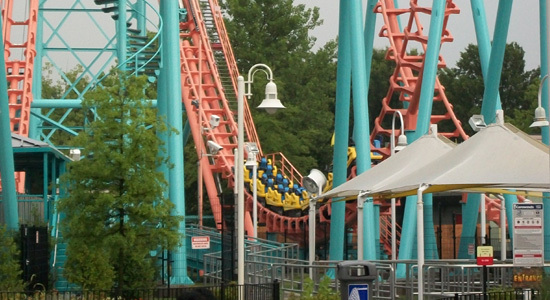 For twenty minutes the riders sat face-up in the pounding rain, lightning and wind, until maintenance workers released the liftchain and the train valleyed. Only then, did the riders get off the coaster. Riders on Carolina Cobra stuck in the rain. Carolina Cobra valleys after having the chainlift released. After the storm past, the crowd came out of hiding. 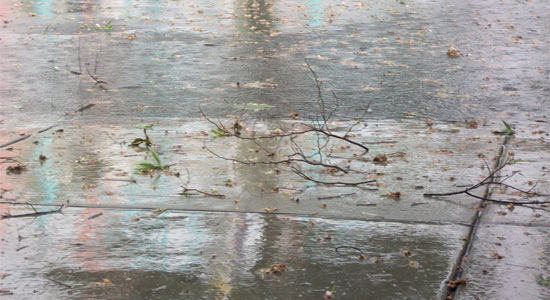 Sarah and I slowly walk around the park, looking at the wet people, rainwater and things blown around by the wind. By 6:30 the power still wasn't on and the park employees began to ask the guests to leave. The park was scheduled to close at eight o'clock and we had a whole day planned at the park tomorrow so it wasn't too big of a loss that we had to leave early. We left the park and drove across the street where they did have power and ate at Shoney's. Today's visit was a nice preview of the full day of action we'll have tomorrow at Carowinds.